The Panerai Antigua Classic Yacht Regatta took place in April with Spirit 65’ Chloe Giselle doing spectacularly well. The owners were on board for their first Caribbean regatta and had a fantastic time at the event. Chloe Giselle is a great cruising yacht with some clever technology, including ECsix standing rigging and titanium spreader bars on a carbon fibre mast, which reduces the weight up high. This coupled with her high-performance sails, meant she was a strong contender in her class. Race legs were predominantly long reaches with small up/down wind legs which prove popular and favour the cruising yachts and the large schooners. It was exciting racing with stiff breezes allowing us to sail Chloe Giselle at some of her best speeds which made for really exhilarating racing after three years of mainly light wind racing. The competition was varied with our main rival, the W class yacht and defending champion, Wild Horses hot on our heels. In my opinion Antigua is one of the best settings for a regatta and the sailing conditions were fantastic. A very well-run event, Antigua is great at accommodating boats of every size and crews of every kind, from the most serious of racers, to those more interested in enjoying the event as a whole, rather than taking the racing too seriously. The regatta organisers kept us thoroughly entertained and held many social gatherings throughout the event in the beautiful and historic setting of Nelson’s dockyard. As a sailing destination Antigua is amongst the best due to its friendly people and laid-back atmosphere, combined with plenty of wind and sunshine. I would really encourage those of you that have not yet experienced Antigua to go and try it for yourself. The sailing conditions were second to none and I would go as far as to say we enjoyed generally perfect sailing every day. Having competed in this regatta twice I can’t wait until the next time! The owners thoroughly enjoyed themselves and Chloe Giselle achieved resounding success, winning all four of her races in the Spirit of Tradition class. 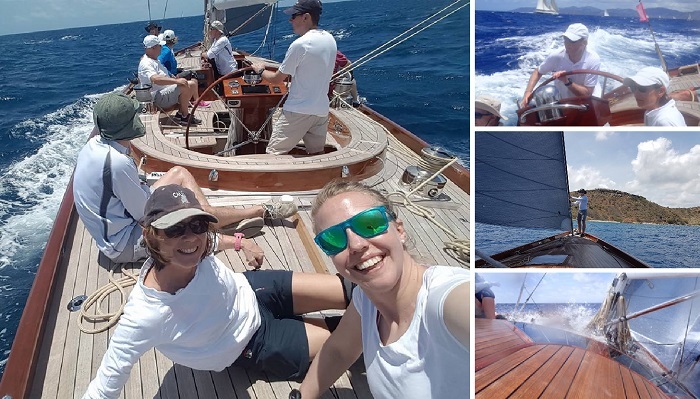 For me the highlight of the event was the opportunity to sail amongst some of the world’s most beautiful yachts and in particular racing Chloe Giselle which I have been involved with from the very beginning of the build process here at the Spirit yard. Getting Chloe Giselle to perform to her best so far with a great bunch of experienced sailors was very special and of course leaving the event with trophies is always a great bonus!